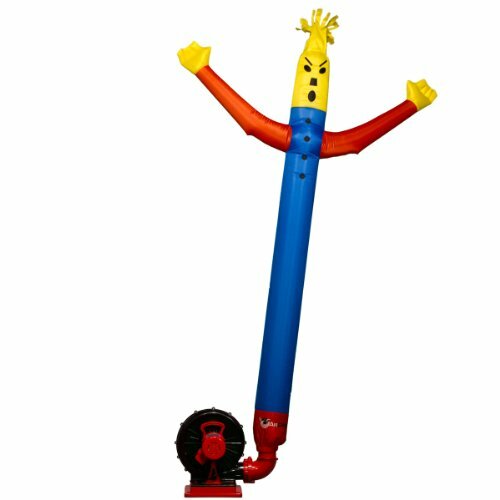 The AirCrow BR-232AC Blackbird is the first inflatable scarecrow invention of its kind that is specifically designed to effectively defend your garden, fruits and vegetables from those unwanted pest that invades your harvest at the most venerable time. BR-232AC Blackbird uses a lifelike erratic movement, which will harmlessly frighten away unwanted animal pest causing them to seek some other area to feed and rest. Using a combination of both sound and movement, BR-232AC Blackbird has created an innovative pest deterrent that is unsurpassed in the market. Our outdoor, UL listed Rook Blower, with its high efficiency motor, can inflate your AirCrow giving it lifelike movements that will scare off even the most stubborn pest. No more banging pie pans, plastic owls, blowup snakes, loud radios, or home made recipes, the BR-232AC Blackbird is the most effective device ever created to protect you from animals invading and destroying the fruit of your labor. If you have any questions about this product by AirCrow, contact us by completing and submitting the form below. If you are looking for a specif part number, please include it with your message.